...of Bedgbury. He sold this manor to Randolph Johnson, gent, who died possessed of it in the reign of Elizabeth. 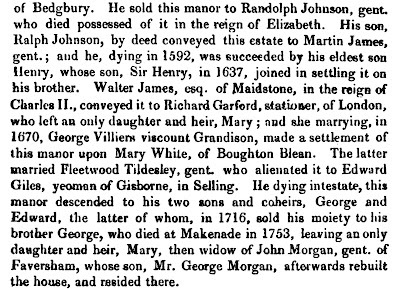 His son, Ralph Johnson, by deed conveyed this estate to Martin James, gent. ; and he, dying in 1592, was succeeded by his eldest son Henry, whose son, Sir Henry, in 1637, joined in settling it on his brother. Walter James, esq. of Maidstone, in the reign of Charles II., conveyed it to Richard Garford, stationer, of London, who left an only daughter and heir, Mary; and she marrying, in 1670, George Villiers viscount Grandison, made a settlement of this manor upon Mary White, of Boughton Blean. 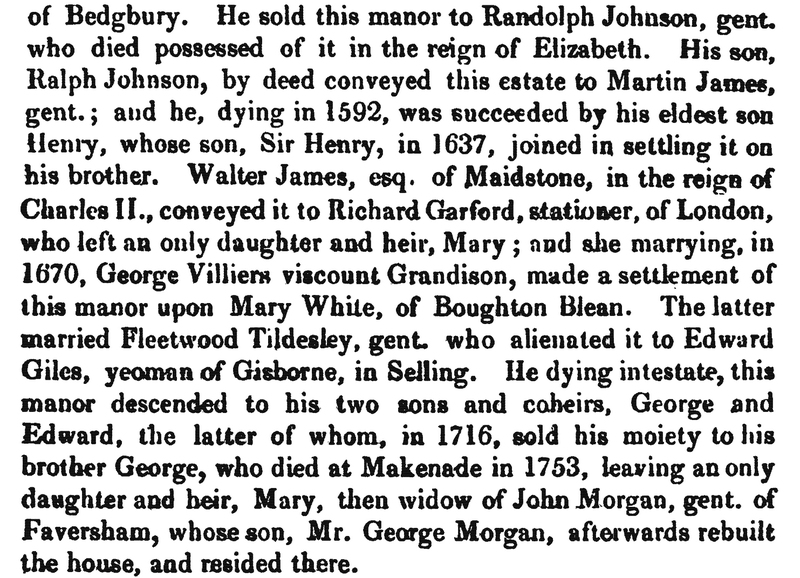 The latter married Fleetwood Tildesley, gent, who alienated it to Edward Giles, yeoman of Gisborne, in Selling. He dying intestate, this manor descended to his two sons and coheirs, George and Edward, the latter of whom, in 1716, sold his moiety to his brother George, who died at Makenade in 1753, leaving an only daughter and heir, Mary, then widow of John Morgan, gent, of Faversham, whose son, Mr. George Morgan, afterwards rebuilt the house, and resided there. Further information—to be posted separately—is available from the records of the Preston Guild. Fleetwood Tyldesley was entered in 1702, and it was noted in 1722 that he had died.